Hanukkah begins at sundown December 8. Celebrate with your students by sharing the book Hershel and the Hanukkah Goblins by Eric Kimmel. In the book, Hershel arrives at a new town just in time for Hanukkah, but the town is strangely dark. No familiar Hanukkah candles flicker in the windows. It is goblins, Hershel discovers, that keep the townspeople from celebrating . The town’s goblins like to smash dreidels, destroy menorahs, and throw latkes on the ground. The goblins hate Hanukkah. Even though he is new to town, Hershel bravely volunteers to stop the goblins and save Hanukkah. Armed with only pickles, eggs, and a menorah, he climbs the hill to the synagogue to face down the goblins. Each night Hershel meets new a new goblin, and each night he defeats it with his swiftness and logic. As in the story of the Maccabees’ victory over the Greeks (the reason we celebrate Hanukkah), it is Hershel’s clever planning that carries him through each confrontation. 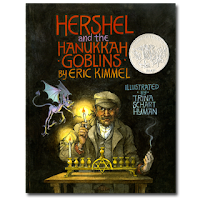 Hershel and the Hanukkah Goblins is a Caldecott Award-winning children’s book that begs to be read aloud. The humorous illustrations and wisecracking dialogue keep the sometimes dark book from becoming scary. It is a treasure for kindergarten and up.